The Milk Run section of the Arkansas River is a fun, fast-moving section of river with a handful of small, bouncy rapids. This section is perfect for young kids, grandparents and timid first-timers. Recommended For: Timid, first-time rafters, families with young children or elderly relatives. Also great for short float fishing trips. Note: When rafting the Milk Run, you should access the river at Johnson Village (where Wilderness Aware Rafting’s private access is located) in order to avoid two large, higher classified rapids that lie between Buena Vista and Johnson Village. Only one of these large rapids has a portage. Join us on the only dinner float the Arkansas River has to offer! Depart from our office in Buena Vista, Colorado and enjoy a short mellow float with spectacular views before stopping for a delicious dinner at the Riverside Grill. Rafters of all skill levels and kids ages 4+ are welcome. Available late-May through mid-August. Price includes dinner voucher. Notes: The Milk Run becomes very rocky and hard to navigate below 500 cfs. REMEMBER:There are two significant class III-IV rapids between Buena Vista Access and Johnson Village. Avoid this section if you have young members in your group. Instructions: When driving down the steep road to the boat ramp, go slowly to avoid skidding, do not back down the boat ramp, and load or unload quickly. Use of picnic tables at the river is prohibited. Fee: $3/kayak or SUP board and $5/raft. No charge for parking. Where to Buy: Check in at the office before parking or using the ramp. They will chase you down if you fail to check in! 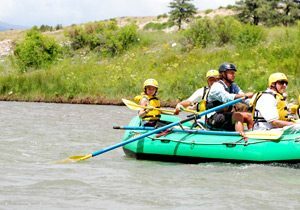 Wilderness Aware Rafting offers self-guided boater vehicle shuttles on limited sections of the Arkansas River. Please contact them at 800.462.7238 or complete an Arkansas River Shuttle Reservation Form on their website.